The Steyr LP50 Compact is a very high quality, pre charged pneumatic air pistol that is manufactured by Steyr Sportwaffen in Austria. The LP50 differs from the other modes in that it has a 5 shot semi auto magazine system to make reloading and taking your next shot a lot quicker. This also makes it very flexible so it can be used for training and competition uses in a range of disciplines. 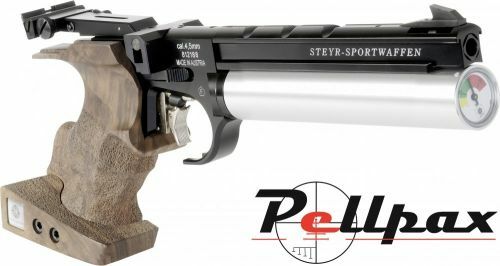 The finish on all of the Steyr pistols is very low maintenance with all aluminium parts anodized to prevent rusting, and any other parts such as the barrel are nickel plated for a great look and durability. The trigger runs on a Ball Bearing axle which is completely free of play, and as it is sealed, no dust can enter and impede the performance, making this one pistol that lasts. All of our Steyr products are official UK Imports and come complete with a hard pistol case.